If you’re planning to store your rugs for any length of time, there are some tips you should follow to make sure your rugs stay in good condition. Most rugs or carpets have some value to the owner, either monetarily or sentimentally, so it makes sense to take as much care as you can when putting them away. They need to be properly prepared before placing in any type of storage. Follow these tips to keep your rugs in top shape. Keeping your rug stored in a climate controlled environment is ideal. If you live in a part of the country that has very hot summers or extremely cold winters, you should consider storing your rugs and carpets in a climate-controlled storage unit. This will ensure your valuables are safe from the elements and will emerge in pristine condition. Following simple tips on how to store rugs to keep them in good condition for future use. Rugs need to be cleaned before placing in storage. Any dirt or soiling left on the rug should be removed or they could cause deterioration of the rug over long-term storage. Clean rugs or carpets based on manufacturer instructions.If the rug is large and not able to be cleaned at home, have it professionally cleaned before storing. Vacuum the rug on both sides before wet cleaning. Vacuum one side and then flip over to vacuum the other. If you are not able to get the carpet professionally cleaned, wash the rug with a gentle detergent. For larger rugs, wet with a garden hose and scrub with a Woolite and water solution. Rugs should be completely dry before putting in storage. Allow rug to air dry for 10-12 hours. After cleaning the rug, spray the rug with insect repellant. A DIY solution is 4 parts water and 1 part vinegar sprayed on both sides of the rug. Then, let the rug dry completely. It is recommend to roll a rug for storage instead of folding. Folded rugs can leave cracks and creases damaging the carpet and the backing of the carpet. To roll a carpet correctly, roll from the “bottom” to the top. Roll the carpet as tight as possible and secure with a piece of rope. Do not store a rug or carpet in direct light. Direct light can fade the carpet’s colors. Keep rugs and carpets stored in a darker, cool and dry storage area. Wrap the rolled carpet in brown craft paper or canvas for storage. DO NOT wrap a rug in plastic. Craft paper allows the rug to “breathe” as well as allows any moisture build-up to escape. Plastic covering causing moisture build-up which could damage to the rug over time. Do not store rugs lying flat on the ground. Store the rug standing up off of the ground. This will help prevent moisture build up from the ground. Do not store anything on top of a stored rug. 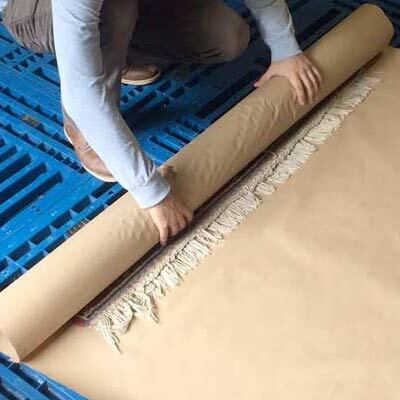 Boxes and other items can cause cracks and destroy a rug’s shape. Unroll a rug every 6-12 months during storage to make sure it is free of any damage. Stop at Triple AAA Storage in West Monroe, LA to see how we can help you with find you the right rug or carpet storage solution.